There's a very strange place on our moon called Ina, a D-shaped depression about 1.2 miles (2 km) wide and 100 feet (30 m) deep — and it's unlike any other feature on the lunar surface. But what caused it? The depression is filled with domes of smooth, dark material which appears to rise above rough, mostly crater-less light material. Its features are particularly sharp, a potential indication that it's relatively young. Recently, Bill Dunford, who's guest blogging at the Planetary Society, stumbled across this incredibly vivid photo, which was taken by the Lunar Reconnaissance Orbiter. Dunford is not the first person to notice Ina, a feature that's located in Lacus Felicitatis (the "Lake of Happiness); Apollo astronauts noticed it and took some photos from orbit. And during the 1990s, the Clementine spacecraft also snapped some images, revealing features that resembled young impact craters. 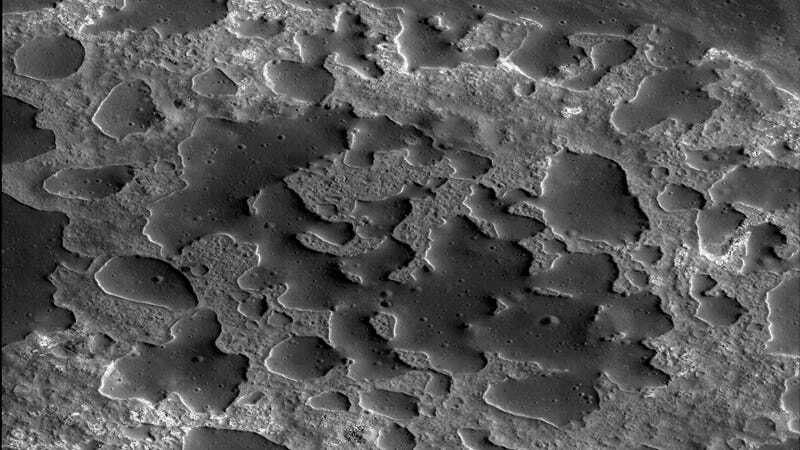 More recently, scientists looked at the best available pictures of Ina, and noted a relative lack of impact craters in the low-lying, light materials. They decided it must be very young. They concluded that Ina is a volcanic feature, the caldera of a low shield volcano, and speculated that perhaps it's a site where—even today—gasses from deep underground might be escaping. Such outgassing events could even be the source of the mysterious flashes of light that amateur astronomers report seeing on the lunar surface from time to time. Then the Lunar Reconnaissance Orbiter sent down even sharper pictures, up to ten times sharper, like this one. As happens so often in science, the new information raised more questions than it answered. Lunar explorers saw that while the lighter material is indeed probably younger that the blobs of darker material, it's not without craters of its own, and may not be all that much younger than the surrounding plains. Rather than places where the ground collapsed, as in an earthly caldera, the lighter areas may be thick lava that flowed between the dark mounds. Be sure to check out more at the always fascinating Planetary Society. The Biggest Explosion Ever Seen on the Moon!